How to Perform Karadaiyan Nombu? - Details on How to observe Karadai Nombu or Savitri Nombhu at Home? Karadaiyan Nonbu or Savitri Nombhu is a Tamil Vratam (Upavasam) observed by Hindu married woman. It is observed for the well being of the husband and for a long and happy married life. 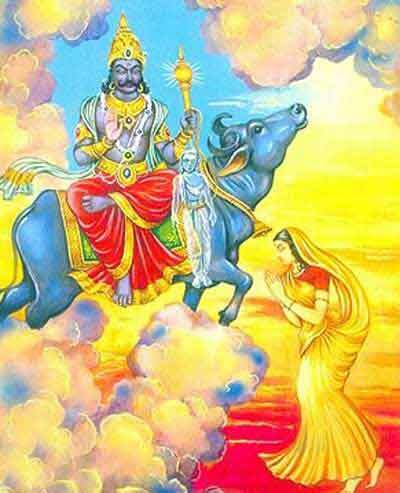 The fast is based on the immortal legend of Sathyavan and Savitri. Here is a brief idea on how to perform Karadaiyan Nonbu at home. First and foremost find the exact time when Maasi month ends and Panguni month starts. The pooja is to be performed at this time. And the fast is observed from the sunrise on the supposed transition day. (For example, if the transition from Maasi to Panguni takes place at today 11 AM, then the fast is from today’s sunrise till 11 AM.) The Savitri Nombu or fast breaking time can be at anytime in the morning or evening. Two important things needed are Karadi or Kaaradai are a yellow thread with few flowers and Karadai dish preparation. Karadai Nombu Thread: Take a yellow thread and tie few flowers and two pieces of turmeric pieces in the middle. When the thread is tied around the neck, the flowers will be like a decoration on a necklace and the turmeric in the center like a pendant. Prepare Karadai adai dish (Nivediya). It is prepared with karamani or toor gram and fresh butter. An idol or image of any married like Goddess Parvati or Kamakshi. How to Perform Karadai Nombu Puja? Prepare the house for pooja which includes cleaning and decorating with mango leaves and drawing of kolam. The fast begins at sunrise and ends when Maasi Month ends and Panguni begins. (This is bit tricky – the ideal method to find the time is the temple priest or one who knows to read the Panchangam). If the fast is too long, some devotees eat some fruits but does not cook or eat rice. An hour or half before the exact transition time, place the banana leaf on the kolam or the puja area and place Karadai dish on the leaf. Other items to place on the leaf are the betel leaf, betel nut, fruits, coconut, banana and butter. Ten minutes or a couple of minutes before the exact transition time, the nivediya is offered to the goddess. It can be offered by sprinkling some water and ringing the bell or by performing an arati. Urugda Venaiyum oru adai nveithan. Then the devotee can wear the yellow thread with flowers and turmeric around the neck. After prayers and the fast is broken by eating a Karadai adai. That which is left on the banana leaf is distributed as prasad along with Karadai dish. Some people perform a Kamakshi Puja during Savithri Noombu. This will need the guidance of a learned elderly person or priest.